Native to south-central China, the giant panda has joined the dragon as a national symbol of the People’s Republic of China and is the theme for this next slot from RTG with prizes of up to x50,000 your bet per line on any given spin. Conceptually the slot attempts to create a serene atmosphere with colourful Chinese architecture on top of turquoise waters and green trees and falling leaves in the background. While the graphics come in above average, these are not among the best that we’ve seen from this developer. Still, if you look at the symbols, then you will find a colourful bird, Peacock, coy, gazebo and pink roses representing the higher-value symbols. You will also find six lower-value poker symbols rounding out the eleven main symbols. As is typical with Chinese-themed slots, you will hear Chinese instrumental music and other thematic audio effects. The giant panda represents a wild symbol that can appear on the 3rd, 4th and 5th reels and replace any other symbol except the fortune scatter symbol. The fortune scatter symbol appearing in sets of 3, 4 or 5 will trigger eight free games. A refreshing differentiator is that when you collect 3 or 4 scatters then a re-spin occurs which gives you the opportunity to add more scatters up to 5 in total. If free games are triggered with three scatter symbols, then 8 Prosperity Free Games are unlocked where a x3 multiplier is applied to all wins that involve a wild symbol. If free games are triggered with 4 scatter symbols, then 8 Wealth Free Games are unlocked where all wins that involve a wild symbol apply a x8 multiplier. If free games are triggered with 5 scatter symbols, then 8 Fortune Free Games are unlocked where all wins have a x5 multiplier attached to them and wins with wilds apply a further x8 up to a total of x40 wins. We found triggering the free games to be extremely difficult though not impossible. 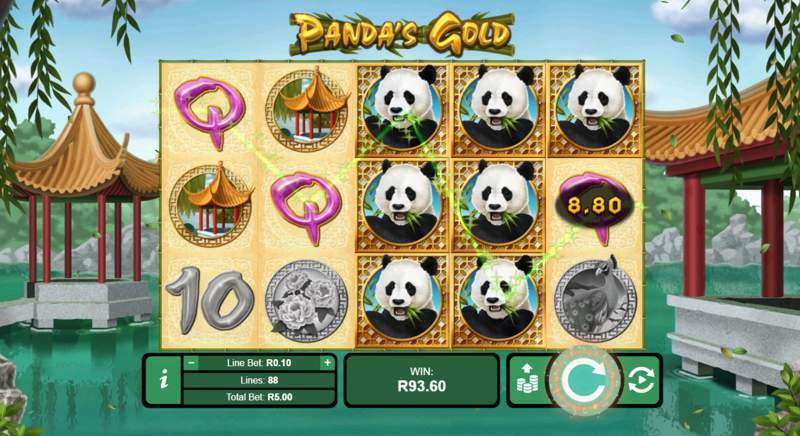 South African players of Panda’s Gold slot can typically vary their wager from R0.01 to R250. The 5-reel game is played on 88 paylines with 50 coins. The volatility for the slot comes at the high end meaning that you will very likely need a higher bankroll to play this game long enough to increase your chances of winning a larger prize. Overall, this slot is not one of our favourite Asian- themed games; however, if you’re prepared to take on this higher volatility slot, then you may find that your effort pays off in a pot of Panda’s Gold. Panda’s Gold slot game does hold some awesome win potential but dry patches can also reduce your bankroll.